Elvis Enthusiasts Unite: Richard Hatch is my doppelganger. Richard Hatch is my doppelganger. It's been sadly brought to my attention that I look a lot like a man who got famous by being naked and fat on the TV. 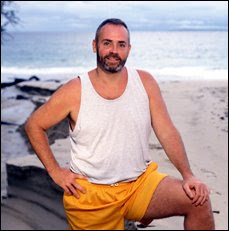 Remember Richard Hatch, the guy who won the money, then took the money and ran? (See left.) That's the one. I wonder if this means I need to start running every day. Or cut dinners right out of my normal routine. Or maybe I just need to punch myself in the face. No matter how you look at it, this does not bode well. Not at all. On a related note, if the choice was between those yellow shorts and wearing my birfday suit, I'd have to go and start a one-man nudist colony as well. Just saying. I vote for punching yourself in the face. Of course, I do. Um, don't quite see the resemblance, but punch yourself anyway. My childhood claims you still deserve it. that guy looks just like my dad!